A popular technique for reducing the bandwidth load on Web servers is to serve the content from proxies. Typically these hosts are trusted by the clients and server not to modify the data that they proxy. SSL splitting is a new technique for guaranteeing the integrity of data served from proxies without requiring changes to Web clients. Instead of relaying an insecure HTTP connection, an SSL splitting proxy simulates a normal Secure Sockets Layer (SSL)  connection with the client by merging authentication records from the server with data records from a cache. This technique reduces the bandwidth load on the server, while allowing an unmodified Web browser to verify that the data served from proxies is endorsed by the originating server. SSL splitting is implemented as a patch to the industry-standard OpenSSL library, with which the server is linked. In experiments replaying two-hour access.log traces taken from LCS Web sites over an ADSL link, SSL splitting reduces bandwidth consumption of the server by between 25% and 90% depending on the warmth of the cache and the redundancy of the trace. Uncached requests forwarded through the proxy exhibit latencies within approximately 5% of those of an unmodified SSL server. Caching Web proxies are a proven technique for reducing the load on centralized servers. For example, an Internet user with a Web site behind an inexpensive DSL line might ask a number of well-connected volunteers to proxy the content of the Web site to provide higher throughput. In today's practice, these proxies must be trusted by both the client and the server to return the data to the client's queries, unmodified. Previous content delivery systems that guarantee the integrity of the data served by proxies require changes to the client software (e.g., to support SFSRO ), or use application-specific solutions (e.g., RPM with PGP signatures ). The former have not seen wide application due to lack of any existing client base. The latter are problematic due to PKI bootstrapping issues and due to the large amount of manual intervention required for their proper use. Our goal is to guarantee the integrity of data served by the proxy without requiring changes to clients. Our approach is to exploit the existing, widely-deployed browser support for the Secure Sockets Layer (SSL) protocol . 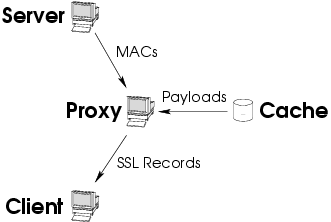 We modify the server end of the SSL connection by splitting it (see Figure 1): the central server sends the SSL record authenticators, and the proxy merges them with a stream of message payloads retrieved from the proxy's cache. The merged data stream that the proxy sends to the client is indistinguishable from a normal SSL connection between the client and the server. We call this technique of splitting the authenticator and data records SSL splitting. Figure 1: Data flow in SSL splitting. SSL splitting cleanly separates the roles of the server and the proxy: the server, as ``author'', originates and signs the correct data, and the proxy, as ``distribution channel'', serves the data to clients. SSL splitting cannot provide confidentiality, since the proxy must have access to the encryption keys shared between client and server to re-encrypt the merged stream; thus, our technique is only useful for distributing public data. SSL splitting also doesn't reduce the CPU load on the server, since the server is still involved in establishing the SSL connection, which requires a public-key operation on the server. The primary advantage of SSL splitting is that it reduces the bandwidth load on the server. Our primary application for SSL splitting is Barnraising, a cooperative Web cache. We anticipate that cooperative content delivery will be useful to bandwidth-hungry Web sites with limited central resources, such as software distribution archives and media artists' home pages. Currently, such sites must be mirrored by people known and trusted by the authors, since a malicious mirror can sabotage the content; Barnraising would allow such sites to harness the resources of arbitrary hosts on the Internet, while still guaranteeing the integrity of the data. Barnraising could also be used by ad hoc cooperatives of small, independent Web sites, to distribute the impact of localized load spikes. The contributions of this paper are: the design of the SSL splitting technique, including the simple protocol between server and proxy to support SSL splitting; an implementation of SSL splitting based on the freely available OpenSSL library; a new, grassroots content-distribution system, Barnraising, which applies SSL splitting to distribute bandwidth load; and experiments that show that SSL splitting has CPU costs similar to SSL, but saves server bandwidth, and improves download times for large files. Our main goal is to guarantee that public data served by caching Web proxies is endorsed by the originating server. Anybody with an inexpensive DSL line should be able to author content and distribute it from his own Web server. To allow this limited connection to support a higher throughput, authors can leverage the resources of well-connected volunteers acting as mirrors of the site's content. However, since the authors may not fully trust the volunteers, we must provide an end-to-end authenticity and freshness guarantee: the content accepted by a client must be the latest version of the content published by the author. Our second goal is to provide the data integrity with minimal changes to the existing infrastructure. More specifically, our goal is a solution that does not require any client-side changes and minimal changes to a server. To satisfy this goal, we exploit the existing support for SSL, by splitting the server end of the connection. Confidentiality is not a goal. The intended use is to distribute public, popular data from bandwidth-limited servers. Most of the content on the Web is not secret, and moreover, most pages that require secrecy are dynamically generated and hence not cacheable. Lack of perfect confidentiality is also an inevitable consequence of caching, because any caching proxy must be able to tell when two clients have downloaded the same file; this requirement violates ciphertext indistinguishability. SSL splitting does not provide all the benefits of traditional, insecure mirroring. While it improves the bandwidth utilization of the central site, it incurs a CPU load similar to a normal SSL server. In addition, it does not improve the redundancy of the site, since the central server must be available in order to authenticate data. Redundant central servers must be employed to ensure continued service in the face of server failure or network partition. The key idea behind SSL splitting is that a stream of SSL records is separable into a data component and an authenticator component. As long as the record stream presented to the client has the correct format, the two components can arrive at the proxy by different means. In particular, a proxy can cache data components, avoiding the need for the server to send the data in full for every client. While SSL splitting does not require changes to the client software, it does require a specialized proxy and modifications to the server software. The modified server and proxy communicate using a new protocol that encapsulates the regular SSL protocol message types and adds two message types of its own. The Secure Sockets Layer protocol provides end-to-end mutual authentication and confidentiality at the transport layer of stream-based protocols . A typical SSL connection begins with a handshake phase, in which the server authenticates itself to the client and shared keys are generated for the connection's symmetric ciphers. The symmetric keys generated for authentication are distinct from those generated for confidentiality, and the keys generated for the server-to-client data stream are distinct from those generated from the client-to-server stream. After completing the handshake, the server and client exchange data asynchronously in both directions along the connection. The data is split into records of 214 bytes or less. For each record, the sender computes a Message Authentication Code (MAC) using the symmetric authentication keys; this enables the receiver to detect any modification of the data in transit. SSL can provide confidentiality as well as integrity: records may be encrypted using the shared symmetric encryption keys. Although SSL generates the keys for both directions from the same ``master secret'' during the handshake phase, the two directions are subsequently independent: the client or server's outgoing cipher state depends only on the previous records transmitted by that party. To access a site using SSL splitting, a Web browser must connect to a proxy using HTTP over SSL/TLS (HTTPS ). The server may have redirected the client to the proxy via any mechanism of its choice, or the proxy may have already been on the path between the browser and the server. 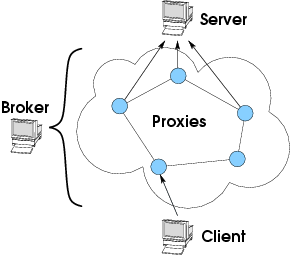 The proxy relays the client's connection setup messages to the server, which in turn authenticates itself to the client via the proxy. Once the SSL connection is set up, the server starts sending application data: for each record, it sends the message authentication code (MAC) along with a short unique identifier for the payload. (See Figure 2.) Using the identifier, the proxy looks up the payload in its local cache, splices this payload into the record in place of the identifier, and relays this reconstructed record to the client. The client verifies the integrity of the received record stream, which is indistinguishable from the stream that would have been sent by a normal SSL server. Figure 2: Decomposition of an SSL stream into authenticators and payloads. The striped box represents the SSL handshake, which is handled by the server. The shaded boxes represent authenticators, while the white boxes represent payloads. Since SSL is resistant to man-in-the-middle attacks, and the proxy is merely a man-in-the-middle with respect to the SSL handshake, the SSL authentication keys are secret from the proxy. Only the server and the client know these keys, which enable them to generate and verify the authentication codes protecting the connection's end-to-end integrity and freshness. When a client initiates an HTTPS connection to an SSL-splitting proxy, the proxy immediately connects to the server using the specialized proxy-server protocol. This protocol defines three message types. The first type of message, verbatim, is a regular SSL record, passed transparently through the proxy from the client to the server, or vice versa. The second type of message, stub, is a compact representation of an SSL record: it contains a MAC authenticator and a short unique identifier for the payload. The third type of message, key-expose, communicates an encryption key from the server to the proxy. When the proxy receives SSL records from the client, it forwards them directly to the server using the verbatim message. The server, however, may choose to compress the data it sends by using the stub message format. When the proxy receives such a message from the server, it looks up the data block identified by the message in its local cache. It then reconstructs a normal SSL record by splicing the MAC authenticator from the stub record together with the payload from the cache, and forwards the resulting valid SSL record to the client. A proxy can properly forward stub messages only if it is able to encode the resulting normal SSL records. If the client and server use SSL with its end-to-end encryption layer enabled, however, the proxy cannot send validly encrypted messages. End-to-end encryption inherently foils caching, because a proxy will not be able to determine when the same data is downloaded by different clients. Therefore, to achieve bandwidth compression, confidentiality-with respect to the proxy-must be abandoned. The correct way to eliminate SSL's encryption layer is to negotiate, during the handshake phase, an authentication-only cipher suite such as SSL_RSA_WITH_NULL_SHA; this is usually done with a Web server configuration setting. When such a cipher suite is in use, no confidentiality is provided for SSL records sent in either direction; only data authentication is provided. Unfortunately, this straightforward approach does not achieve full compatibility with the existing installed client base, because current versions of many popular Web browsers, such as Netscape and Internet Explorer, ship with authentication-only cipher suites disabled. The SSL splitting protocol provides a work-around for this problem, which can be enabled by the server administrator. If the option is enabled and a client does not offer an authentication-only cipher suite, the server simply negotiates a normal cipher suite with the client, and then intentionally exposes the server-to-client encryption key and initialization vector (IV) to the proxy using the key-expose message. SSL computes the encryption key, IV, and MAC key as independent pseudo-random functions (PRF) of the master secret. Because SSL uses different PRFs for each key, revealing the cipher key and IV to the proxy does not endanger the MAC key or any of the client-to-server keys [19,p. 165]. Hence, key-expose preserves the data-authentication property. When the key-expose feature is turned on and an encrypted cipher suite is negotiated, the client-to-server encryption keys are withheld from the proxy; thus, it would be possible to develop an application in which the information sent by a client was encrypted, while the content returned by the server was unencrypted and cacheable by the proxy. However, unless the application is carefully designed, there is a danger of leaking sensitive data in the server's output, and so we do not recommend the use of SSL splitting in this mode without very careful consideration of the risks. If necessary, an application can restrict the set of hosts with access to the cleartext to the client, the server, and the proxy, by encrypting the proxy-server connection. For example, one could tunnel the proxy-server connection through a (normal) SSL connection. Of course, this feature would be useful only in applications where the proxy can be trusted not to leak the cleartext, intentionally or not; as above, we do not recommend this mode of operation. SSL splitting does not mandate any particular cache coherency mechanism, but it does affect the factors that make one mechanism better than another. In particular, caching with SSL splitting is at the SSL record level rather than at the file level. In theory, a single file could be split up into records in many different ways, and this would be a problem for the caching mechanism; however, in practice, a particular SSL implementation will always split up a given data stream in the same way. Deciding which records to encode as verbatim records and which to encode as stub records can be done in two ways. The server can remember which records are cached on each proxy, and consult an internal table when deciding whether to send a record as a stub. However, this has several disadvantages. It places a heavy burden on the server, and does not scale well to large numbers of proxies. It does not give the proxies any latitude in deciding which records to cache and which to drop, and proxies must notify the server of any changes in their cached set. Finally, this method does not give a clear way for the proxies to initialize their cache. Our design for SSL splitting uses a simpler and more robust method. The server does not maintain any state with respect to the proxies; it encodes records as verbatim or stub without regard to the proxy. If the proxy receives a stub that is not in its local cache, it triggers a cache miss handler, which uses a simple, HTTP-like protocol to download the body of the record from the server. Thus, the proxies are self-managing and may define their own cache replacement policies. This design requires the server to maintain a local cache of recently-sent records, so that it will be able to serve cache miss requests from proxies. Although a mechanism similar to TCP acknowledgements could be used to limit the size of the server's record cache, a simple approach that suffices for most applications is to pin records in the cache until the associated connection is terminated. The cache-miss design permits the server to use an arbitrary policy to decide which records to encode as stub and hence to make available for caching; the most efficient policy depends on the application. For HTTPS requests, an effective policy is to cache all application-data records that do not contain HTTP headers, since the headers are dynamic and hence not cacheable. Most of the records in the SSL handshake contain dynamic elements and hence are not cacheable; however, the server's certificates are cacheable. Caching the server certificates has an effect similar to that of the ``fast-track'' optimization described in , and results in an improvement in SSL handshake performance. This caching is especially beneficial for requests of small files, where the latency is dominated by the SSL connection time. Since the stub identifier is unique and is not reused, there is no need for a mechanism to invalidate data in the cache. When the file referenced by an URL changes, the server sends a different stream of identifiers to the proxy, which does not know anything about the URL at all. In contrast, normal caching Web proxies  rely on invalidation timeouts for a weak form of consistency. Our implementation of SSL splitting consists of a self-contained proxy module and a patched version of the OpenSSL library, which supports SSL version 3  and Transport Layer Security (TLS) . We chose to patch OpenSSL, rather than developing our own protocol implementation, to simplify deployment. Any server that uses OpenSSL, such as the popular Web server Apache, works seamlessly with the SSL splitting protocol. In addition, the generic SSLizing proxy STunnel, linked with our version of OpenSSL, works as an SSL splitting server: using this, one can set up SSL splitting for servers that don't natively understand SSL. This allows SSL splitting to be layered as an additional access method on top of an existing network resource. Our modified version of OpenSSL intercepts the record-encoding routine do_ssl_write and analyzes outgoing SSL records to identify those that would benefit from caching. Our current implementation tags non-header application-data records and server certificate records, as described in Section 3.5. Records that are tagged for caching are hashed to produce a short digest payload ID, and the bodies of these records are published to make them available to proxies that do not have them cached. While publishing may take many application-specific forms, our implementation simply writes these payloads into a cache directory on the server; a separate daemon process serves this directory to proxies. Records that are not tagged for caching use the literal payload ``ID'' encoding. Whether or not the record is tagged for caching, the library encodes the record as a stub message; this design choice simplifies the code. Because the server may have to ship its encryption key and IV to the proxy, the modified OpenSSL library contains additional states in the connection state machine to mediate the sending of the key-expose message. The server sends this message immediately after any change_cipher_spec record, since at this point the connection adopts a new set of keys. The proxy is simple: it forks off two processes to forward every accepted connection. It is primarily written in OO Perl5, with the performance-critical block cipher and CBC mode implementation in C. The proxy includes a pluggable cache hierarchy: when a cache lookup for a payload ID fails, it can poll outside sources, such as other proxies, for the missing data. If all else fails, the server itself serves as an authority of last resort. Only if none of these have the payload will the proxy fail the connection. The proxy could also replace verbatim messages from the client to the server with stub messages to avoid sending the complete request to the server. Because the client's data consists primarily of HTTP GET requests, however, which are already short and are not typically repeated, our current proxy doesn't do so. In the future, though, we may explore a proxy that compresses HTTP headers using stub messages. Figures 3 and 4 show the format of verbatim and stub message in the same notation as the SSL specification. The main difference between verbatim and stub is that in stub the payload is split into a compact encoding of the data and a MAC authenticator for the data. Also, a stub record is never encrypted, since the proxy would have to decrypt it anyway in order to manipulate its contents. Figure 3: Format of a verbatim SSL record. Figure 4: Format of a stub message. We have defined two types of encoding for the payload. The literal encoding is the identity function; this encoding is useful for software design reasons, but is functionally equivalent to a verbatim SSL record. The digest encoding is a SHA-1  digest of the payload contents. This encoding provides effectively a unique identifier that depends only on the payload. This choice is convenient for the server, and allows the proxy to store payloads from multiple independent servers in a single cache without concern about namespace collisions. There are many alternative ID encodings possible with the given stub message format; for example, a simple serial number would suffice. The serial number, however, has only small advantages over a message digest. A serial number is guaranteed to be unique, unlike a digest. On the other hand, generating serial numbers requires servers to maintain additional state, and places an onus upon proxies to separate the caches corresponding to multiple servers; both of these result in greater complexity than the digest encoding. Another alternative is to use as the encoding a compressed representation of the payload. While this choice would result in significant savings for text-intensive sites, it would not benefit image, sound, or video files at all, since most media formats are already highly compressed. For this reason, we have not implemented this feature. The key-expose message is used to transmit the server encryption key and IV to the proxy (see Figure 5), if this feature is enabled. In our implementation, stub records are sent in the clear to the proxy, which encrypts them before sending them to the client. Figure 5: Format of key-expose message. Using SSL splitting, we have developed Barnraising, a cooperative Web caching system consisting of a dynamic set of ``volunteer'' hosts. The purpose of this system is to improve the throughput of bandwidth-limited Web servers by harnessing the resources of geographically diverse proxies, without trusting those proxies to ensure that the correct data is served. Volunteers join or leave the proxy set of a site by contacting a broker server, which maintains the volunteer database and handles redirecting client requests to volunteers. Volunteer hosts do not locally store any configuration information, such as the SSL splitting server's address and port number. These parameters are supplied by the broker in response to the volunteer's join request, which simply specifies an identifying URI of the form barnraising://broker.domain.org/some/site/name. This design enables a single broker to serve any number of Barnraising-enabled Web sites, and permits users to volunteer for a particular site given only a short URI for that site. Since configuration parameters are under the control of the broker, they can be changed without manually reconfiguring all proxies, allowing sites to upgrade transparently. The broker represents a potential bottleneck for the system, and it could be swamped by a large number of simultaneous join or leave requests. However, since the join/leave protocol is lightweight, this is unlikely to be a performance issue under normal operating conditions. If the load incurred by requests is high compared to the actual SSL splitting traffic, the broker can simply rate-limit them until the proxy set stabilizes at a smaller size. Figure 6: Proxy set for a site using Barnraising. Barnraising currently employs the DNS redirection method , but could be modified to support other techniques, such as URL rewriting [10,1]. Barnraising's broker controls a mysql  database, from which a mydns  server processes DNS requests. Consider a client resolving an URL https://www.domain.org/foo/. If www.domain.org is using Barnraising, the DNS server for domain.org is controlled by the broker, which will resolve the name to the IP address of a volunteer proxy. We chose redirection using DNS because it maintains HTTPS reference integrity - that is, it guarantees that hyperlinks in HTML Web pages dereference to the intended destination pages. HTTPS compares the hostname specified in the https URL with the certificate presented by the server. Therefore, when a client contacts a proxy via a DNS name, the certificate presented to the client, by the server, via the proxy, must match the domain name. When DNS redirection is used, the domain name will be of the form www.domain.org, and will match the domain name in the certificate. The client will initiate an HTTPS connection to the proxy, which will forward that request, using SSL splitting, to the server. Since frequently-accessed data will be served out of the proxy's cache, the central server's bandwidth usage will be essentially limited to the SSL handshake, MAC stream, and payload IDs. To increase the set of cached payloads available to a proxy, while decreasing the local storage requirements, proxies could share the cache among themselves. In this design, volunteer nodes would join a wide-area Distributed Hash Table (DHT)  comprising all of the volunteers for a given Web site. When lookups in the local cache fail, nodes could attempt to find another volunteer with the desired data item by looking for the data in the DHT. If that fails too, the proxy would contact the central server. Blocks in the DHT are named by the same cryptographic hash used for stub IDs. This decision allows correctly-operating volunteers to detect and discard any invalid blocks that a malicious volunteer might have inserted in the DHT. Barnraising is designed to be initially deployed as a transparent layer over an existing Web site, and incrementally brought into the core of the Web server. Using STunnel linked with our patched OpenSSL library, an SSL splitting server that proxies an existing HTTP server can be set up on the same or a different host; this choice allows Barnraising to be tested without disrupting existing services. If the administrator later decides to move the SSL splitting server into the core, he can use Apache linked with SSL-splitting OpenSSL. The broker requires a working installation of mysql and mydns; since it has more dependencies than the server, administrators may prefer to use an existing third-party broker while testing Barnraising. This choice brings the third party into the central trust domain of the server; much like a traditional mirror, it is a role which can only be filled by a reputable entity. The utility of Barnraising will be limited by the volunteer proxies that join it. Therefore, the proxy software has been designed to be simple to install and use, requiring only a single URI to configure. Since volunteers will be able to download from each other, they will have better performance than regular clients, giving users an incentive to install the software. In the long term, we hope to incorporate more efficient authentication schemes, such as SFSRO , into the volunteer code, using the installed base of SSL splitting software to bootstrap the more technically sophisticated systems. This section presents microbenchmarks and trace-based experiments to test the effectiveness and practicality of SSL splitting. The results of these experiments demonstrate that SSL splitting decreases the bandwidth load on the server, and that the performance with respect to uncached files is similar to vanilla SSL. For the experiments we used the Apache web server (version 1.3.23), linked with mod_ssl (version 2.8.7), and OpenSSL (version 0.9.6), running under Linux 2.4.18 on a 500 MHz AMD K6. This server's network connection is a residential ADSL line with a maximum upstream bandwidth of 160 kbps. The client was a custom asynchronous HTTP/HTTPS load generator written in C using OpenSSL, running under FreeBSD 4.5 on a 1.2 GHz Athlon. The proxy, when used, ran under FreeBSD 4.5 on a 700 MHz Pentium III. Both the client and the proxy were on a 100 Mbps LAN, with a 100 Mbps uplink. Figure 7: Ratio of throughput achieved to bandwidth used, when retrieving a single file from the server. 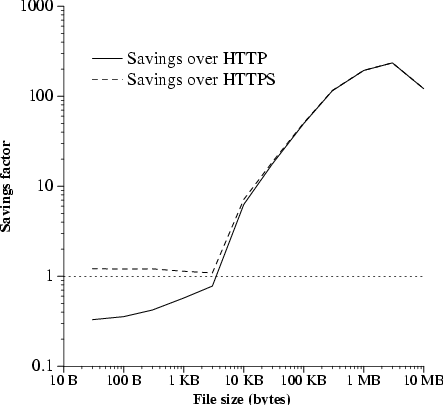 Figure 8 shows this data as the ``savings factor'', the ratio of bandwidth consumed by SSL splitting (with a warm cache) to that consumed by HTTP or HTTPS to transmit the same file. For 100-byte files, plain HTTP has about one-third the cost of SSL splitting, since the bandwidth cost for small files is dominated by connection setup; on the other hand, for one-megabyte files, SSL splitting has a bandwidth savings of 99.5% over HTTP. Figure 8: Bandwidth savings of SSL splitting over HTTP and HTTPS. There are two artifacts evident in these graphs. 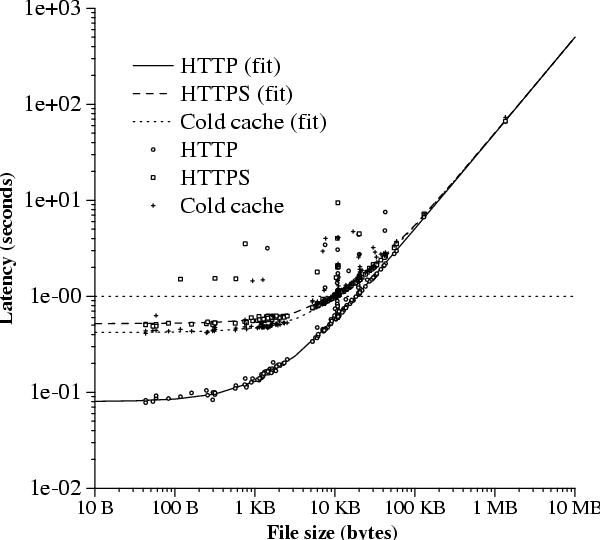 They show a sharp curve upward at the 3,000 byte point; the reason for this artifact is that Apache sends all of the HTTP headers and file data in a single SSL record for files smaller than roughly 4,000 bytes, but sends the HTTP headers in a separate record from the file data for larger files. There is also a sharp performance drop between 3 megabytes and 10 megabytes: this is because, for files larger than 222 bytes, Apache sends the file data in records of 8,192 bytes, instead of the maximum record size of 16,384 bytes. The next set of experiments uses traces from two Web servers to evaluate SSL splitting on realistic workloads. The Web traces were derived from several-month access.log files taken from two departmental Web servers, www.lcs.mit.edu and amsterdam.lcs.mit.edu. To convert the access logs into replayable traces, all non-GET, non-status-200 queries were filtered out, URLs were canonicalized, and every (URL,size) pair was encoded as a unique URL. The server tree was then populated with files containing random bytes. The www.lcs trace, which is seven months long, contains 109 GB of downloads from a server with 10.6 GB of files; the amsterdam trace, which is nine months long, contains 270 GB of downloads from 77 GB of files. Analyzing randomly-chosen chunks of various lengths from www.lcs showed that most repetition is long-term: a day's trace (typically about 100 MB of data transfer) has a repetition factor which varies between 1.5 and 3, while a month is compressible by about a factor of 4, and the whole trace is compressible by a factor of 10. This data suggests that having proxies keep blocks around for a long time will pay off, and supports a design in which proxies are organized into a DHT, since this allows them to store more unique blocks for a longer period of time. To keep running experiments manageable over an ADSL line, we selected a typical daytime chunk representing approximately 10 MB of transfers from each trace. Figure 9 shows the distribution of request sizes in each trace chunk, along with the distribution in the full traces. The www.lcs chunk represents 4.43 MB of files and 10.0 MB of transfers, for an inherent compressibility factor of 2.26; the amsterdam chunk represents 8.46 MB of files and 11.6 MB of transfers, for an inherent compressibility factor of 1.37. Figure 9: CDF of request sizes in www.lcs and amsterdam traces. None of our experiments placed any limits on the size of the proxy's cache, since it seems reasonable for a mirror host (or DHT) to store a full copy of a 10-70 GB Web site. In the future, we plan to investigate the impact of the size of the cache on SSL splitting's performance. Figure 10: Bandwidth usage: www.lcs trace. Figure 11: Bandwidth usage: amsterdam trace. As expected, SSL splitting with a cold cache achieves a compression ratio of 2.04 on www.lcs and 1.25 on amsterdam, with respect to HTTP; the compression is about 5% more with respect to HTTPS, very close to the inherent redundancy. If the cache is warmed before running the trace, the compression ratio is approximately a factor of 11 for www.lcs and 10 for amsterdam. Analysis of the portions of the trace file preceding the www.lcs chunk indicate that if the previous two weeks had been cached by the proxy, the cache would have been approximately 90% warm. The amsterdam chunk is too close to the beginning of the trace to perform this analysis. The 10 MB trace chunks used in our experiments span only a few hours each; thus, they might not be representative of Web site traffic over long periods. In addition, the short chunks do not contain as high a degree of repetition as the long traces. Since it is impractical to replay a several-month-long trace from a busy Web site over an ADSL link, we turned to simulation to estimate the likely performance of SSL splitting over long periods. Based on the data collected in the single-file microbenchmark, we constructed a simple linear model of the performance of HTTP, HTTPS, and SSL splitting in the uncached case: the bandwidth used is a fixed per-file cost plus a marginal per-byte cost. The marginal cost is slightly greater than one because of packet and record overhead. We model the cost of SSL splitting (in the cached case) as a piecewise linear function: for files smaller than 4,000 bytes, the marginal cost is greater than one, but for larger files, the marginal cost per byte is very small, approximately 1/250. The marginal cost increases to about 1/120 for files larger than 222 bytes. This simple performance model fits the microbenchmark results to within 5%. In addition, to validate the model, we simulated each experiment with 10 MB trace chunks. The simulated results, shown as the white bars in Figures 10 and 11, agree very closely with the measured results. The results of simulating the full traces, shown as the striped bars, demonstrates that SSL splitting can take advantage of most of the available redundancy. For example, on the www.lcs trace, SSL splitting would have a bandwidth savings of 83% over HTTP; an ideal protocol with zero overhead and perfect caching would save 90%. When the proxy's cache is cold, SSL splitting performs similar work to regular SSL; thus, we expect their latency characteristics to be similar. However, repetition within the trace confuses the analysis of latency factors, since cached files are faster to download than uncached files. To address this issue, we filtered out repetitions from the www.lcs trace chunk, and using the resulting uncacheable trace, measured the start and end times of each request. In order to avoid congestion effects, we performed requests one at a time. The resulting graph of latencies versus file size is shown in Figure 12. It shows three clear lines, one for each of HTTP, HTTPS, and cold SSL splitting. Cold SSL splitting is about 10% faster than HTTPS for small file sizes and about 10% slower than HTTPS for large file sizes, but for the most part they are a close match: the majority of file downloads had less than a 5% difference between the two latencies. Figure 12: Distribution of latencies vs. file sizes. The implementation of SSL splitting provides the option to accept clients using a cipher-suite with encryption, and to expose intentionally the encryption key to the proxy (see Section 3.4). Since the only indication of security in most web browsers is a simple on/off lock icon, there is a legitimate question of whether it is reasonable to mislead clients about whether their communications with the server are encrypted and secure against eavesdroppers. We expect that most applications of SSL splitting will not have any Web forms, since it would be pointless to try to cache dynamic content. However, a user browsing an URL beginning with https: might reasonably believe that his browsing pattern was not available to eavesdroppers; the only way to deal with this is to notify the user in the text of the Web page. In any case, normal SSL provides no guarantee that the server will keep its transmissions private; SSL splitting is merely equivalent to an SSL server which sends a carbon copy of all transmissions to a proxy. In the current design of the SSL splitting protocol, the cache is a transparent forwarding proxy operating at the level of SSL records. An alternative approach would have been to have the client connect directly to the server, and have the server compress its outgoing stream by converting outgoing IP packets containing SSL records to stub records sent to the cache. The cache would then reconstitute the IP packets and send them to the client, forging the server's IP address and the TCP header. This approach would have the benefit of reducing the number of round-trip packet flight times from four to three, and would also permit the server to ``stripe'' a connection with a single client across multiple caches. An additional benefit is that no DNS or HTTP redirection technique would be necessary, since the client's transmissions would be directly to the server. However, operating at the IP layer instead of the SSL record layer is fraught with peril: operating system interfaces are nonstandard and unreliable, networks are likely to black-hole forged packets, and TCP will not behave properly. Also, such an approach risks creating an ``open relay'' which could be used by malicious clients to hide the source of a denial-of-service attack. Caching and replication in the Web is a subject of much study. Like content-distribution networks  and peer-to-peer systems , the primary focus of Barnraising is cooperatively sharing the load of serving data. The main difference between Barnraising and previous work is the use of SSL splitting, which allows Barnraising to serve data securely through untrusted proxies to unmodified clients. The standard approach to providing integrity of data is signing the cryptographic hash of the data with the server's private key (or with the private key of the data's owner). When the client receives the data and its signature (perhaps through different channels), it verifies the integrity of the data by verifying the signature. This solution is typically bundled in the client of a specific application, which users must download to use the application. RPM  and FreeNet  are among the many applications that use this solution. The system closest in spirit to Barnraising is read-only SFS . SFSRO allows secure distribution of software bundles through untrusted machines. It provides a generic file system interface, allowing unmodified applications to use SFSRO to distribute data securely. However, SFSRO requires that an SFS client runs on the client machine, which restricts its deployment to SFS users. On the other hand, unlike SSL splitting, the SFSRO server has to serve only the root block to clients, and the computational requirements on the server, untrusted machines, and client are low. The Secure HTTP (S-HTTP)  protocol contains built-in support for caching proxies, in the form of the ``320 SHTTP Not Modified'' response code. Like SSL splitting, S-HTTP provides an end-to-end freshness and integrity guarantee, but it also provides limited support for confidentiality from the proxy. S-HTTP's computational requirements are similar to SSL, and like SFSRO, the deployment of this protocol is limited. Untrusted surrogates  allow storage-limited clients to cache data on nearby surrogate machines. A server stores data on the surrogate on behalf of the client, and sends the hash of the data to the client; hence, the client can verify the integrity of data when retrieved from the surrogate. WASP is a proxy for HTTPS connections . Like SSL splitting, it doesn't require client changes, and defines a separate protocol between proxy and server. Unlike SSL splitting, WASP sends the SSL master secret to the proxy. Since SSL uses the master secret to compute the session keys for both encryption and authentication, this solution puts considerably more trust in the proxy than SSL splitting does. A malicious WASP proxy can change the cached data without the client knowing it. Proxy certificates  provides restricted impersonation within an X.509 public-key infrastructure. A Web site could generate a proxy certificate and hand it to a proxy. The client can then verify the proxy certificate to determine whether the proxy is trusted by the web site to serve the data. Proxy certificates require client changes to process the new X.509 certificate extensions fields. Commercial content-distribution systems  own the machines they use for serving data and therefore trust them. When a client contacts a server with HTTPS via a content-distribution network, the client must trust the content-distribution network to authenticate the server. If SSL splitting were used, the client itself could authenticate the server; also, this would simplify the operation of the content-distribution system. Most of the content distribution systems based on recently-developed, scalable lookup primitives [21,13,3] protect the integrity of data by identifying the data by its cryptographic hash, but the clients must run specialized software to participate in those systems. Squirrel  doesn't require special client software, but it doesn't provide data integrity. These systems complement Barnraising by providing it with good techniques for organizing the proxies. SSL splitting is a novel technique for safely distributing the network load on Web sites to untrusted proxies without requiring modifications to client machines. However, because SSL splitting is effective only at reducing bandwidth consumption when the proxy has access to the plaintext of the connection, it is not appropriate for applications that require confidentiality with respect to the proxy. In addition, SSL splitting incurs a CPU load on the central server due to public-key cryptography operations; it does not address the issue of distributing this load. The main benefits of SSL splitting are that it provides an end-to-end data-integrity guarantee to unmodified clients, that it reduces the bandwidth consumed by the server, and that it requires only a simple protocol between the server and the proxy. Experiments with a modified OpenSSL library that supports SSL splitting show significant bandwidth savings for files larger than 4,000 bytes: when the data of a file is cached on the proxy, the server need only transmit the SSL handshake messages, HTTP header, MAC stream, and payload IDs. Because of these advantages and the ease of deployment, we hope that SSL splitting will form a convenient transition path for content-distribution systems to provide end-to-end data integrity. We thank David Anderson, Russ Cox, Kevin Fu, Thomer Gil, Jacob Strauss, Richard Tibbetts, the anonymous reviewers, the members of the MIT SIPB, and the members of the PDOS group at MIT. Also, thanks to the denizens of TOE, Noah Meyerhans, and the www.lcs.mit.edu webmasters, for making our measurements possible. More information on SSL splitting and Barnraising can be found at http://pdos.lcs.mit.edu/barnraising/ . Cain, B., Barbir, A., Nair, R., and Spatscheck, O. Known CN request-routing mechanisms. draft-ietf-cdi-known-request-routing-02.txt, Network Working Group, November 2002. Clarke, I., Sandberg, O., Wiley, B., and Hong, T. W. Freenet: A distributed anonymous information storage and retrieval system. In Proc. ICSI Workshop on Design Issues in Anonymity and Unobservability (Berkeley, California, June 2000). http://freenet.sourceforge.net. Dabek, F., Kaashoek, M. F., Karger, D., Morris, R., and Stoica, I. Wide-area cooperative storage with CFS. In Proc. 18th ACM Symposium on Operating Systems Principles (SOSP '01) (Oct. 2001). Dierks, T., and Rescorla, E. The TLS protocol version 1.1. draft-ietf-tls-rfc2246-bis-04.txt, Network Working Group, April 2003. FIPS 180-1. Secure Hash Standard. U.S. Department of Commerce/N.I.S.T., National Technical Information Service, Springfield, VA, April 1995. Flinn, J., Sinnamahidee, S., and Satyanarayanan, M. Data staging on untrusted surrogates. Tech. Rep. IRP-TR-02-2, Intel Research, May 2002. Freier, A. O., Karlton, P., and Kocher, P. C. The SSL protocol version 3.0. Internet draft (draft-freier-ssl-version3-02.txt), Network Working Group, November 1996. Work in progress. Fu, K., Kaashoek, M. F., and Mazières, D. Fast and secure distributed read-only file system. ACM Transactions on Computer Systems 20, 1 (February 2002), 1-24. Iyer, S., Rowstron, A., and Druschel, P. Squirrel: A decentralized, peer-to-peer web cache. In 21st ACM Symposium on Principles of Distributed Computing (PODC 2002) (July 2002). Jannotti, J., Gifford, D. K., Johnson, K. L., Kaashoek, M. F., and O'Toole, Jr., J. W. Overcast: Reliable multicasting with an overlay network. In Proc. of the 4th OSDI (Oct. 2002), pp. 197-212. Karger, D., Leighton, T., Lewin, D., and Sherman, A. Web caching with consistent hashing. In The eighth Word Wide Web Conference (Toronto, Canada, May 1999). Krishnamurthy, B., Wills, C., and Zhang, Y. On the use and performance of content distribution networks. Tech. Rep. TD-52AMHL, ATT Research Labs, Aug. 2001. Kubiatowicz, J., Bindel, D., Chen, Y., Czerwinski, S., Eaton, P., Geels, D., Gummadi, R., Rhea, S., Weatherspoon, H., Weimer, W., Wells, C., and Zhao, B. OceanStore: An architecture for global-scale persistent storage. In Proceeedings of the Ninth international Conference on Architectural Support for Programming Languages and Operating Systems (ASPLOS 2000) (Boston, MA, November 2000), pp. 190-201. Modadugu, N., and Goh, E.-J. The design and implementation of WASP: a wide-area secure proxy. Tech. rep., Stanford, Oct. 2002. http://crypto.stanford.edu/~eujin/papers/wasp.ps. MySQL AB. MySQL database server. http://www.mysql.com/. Oram, A., Ed. Peer-to-peer: Harnessing the power of disruptive technologies. O'Reilly, Mar. 2001. Rescorla, E. HTTP over TLS. RFC 2818, Network Working Group, May 2000. Rescorla, E. SSL and TLS. Addison-Wesley, 2001. Rescorla, E., and Schiffman, A. The Secure HyperText Transfer Protocol. RFC 2660, Network Working Group, 1999. Rowstron, A., and Druschel, P. Storage management and caching in PAST, a large-scale, persistent peer-to-peer storage utility. In Proc. 18th ACM Symposium on Operating Systems Principles (SOSP '01) (Oct. 2001). Shacham, H., and Boneh, D. Fast-track session establishment for TLS. In Proceedings of NDSS (Feb. 2002), M. Tripunitara, Ed., Internet Society, pp. 195-202. http://hovav.net/. Tucke, S., Engert, D., Foster, I., Welch, V., Thompson, M., Pearlman, L., and Kesselman, C. Internet x.509 public key infrastructure proxy certificate profile. Internet draft (draft-ietf-pkix-proxy-03), Network Working Group, October 2002. Work in progress. Wessels, D. Squid internet object cache. http://squid.nlanr.net/Squid/. www.rpm.org. RPM software packaging tool. http://www.rpm.org/. This research was partially supported by MIT Project Oxygen and the IRIS project ("http://iris.csail.mit.edu/"), funded by the National Science Foundation under Cooperative Agreement No. ANI-0225660.